Traumatic brain injury (TBI), also known as acquired brain injury, refers to sudden physical trauma to the brain. In many cases, TBI is caused by car accidents or industrial accidents, which sometimes occur due to negligence on the part of one of the drivers or the employer, respectively. When negligence or wrongful actions lead to injuries or wrongful death, victims and their families are sometimes able to gain compensation for medical expenses, pain and suffering, loss of income and other factors by filing a claim for car accident injury. TBI is an American epidemic. Each year, 1.5 million people suffer brain damage and other head injuries, and 52,000 people die as a result, making traumatic brain injury the number one cause of death and disability among Americans between the ages of one and 44.1 If someone you know has suffered a traumatic brain injury, personal injury lawyers with experience litigating TBI cases can help you determine if you are eligible for compensation to assist with medical bills and other expenses. The effects of traumatic brain injury vary depending on the type and severity of injury to the brain. 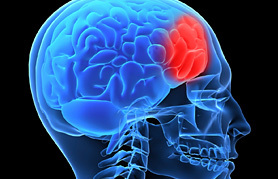 There are two main types of TBI resulting from head damage: closed head brain injury and open head injury (penetrating). Sometimes brain injuries are sustained prior to birth or during the birthing process. These injuries, known as congenital brain injuries do not involve blunt trauma and therefore are not considered "traumatic" brain injuries. Nevertheless, some birth injuries can cause permanent brain damage. To learn more, visit Your Legal Guide's page devoted to injuries resulting from defects at birth. Closed head injuries occur when victims hit their head on an object, such as a dashboard or windshield, with extreme force. The impact can cause damage to the area of the brain that absorbs this force (focal trauma) as well as other areas (diffuse brain injuries) sometimes resulting in a skull concussion. Diffuse brain injuries often cause communication difficulties, because the areas of the brain most susceptible to damage due to movement are those that affect communication. Open head injuries occur when something, such as a bullet, pierces the skull. This type of traumatic brain injury damages the area of the brain near the point of penetration; it is less likely to cause damage to other parts of the brain (diffuse injuries). Open head injuries often lead to infection when bone fragments, dirt or other foreign objects are trapped inside the skull. Traumatic brain injury is most often caused by motor vehicle accidents. Because collisions so often occur due to speeding and reckless driving, traumatic brain injury lawsuits that stem from auto accidents often come down to proving negligence on the part of the person who was speeding or driving recklessly. To determine whether a patient sustained a traumatic brain injury, doctors look for the symptoms listed above and conduct imaging tests to study the brain. Depending on the patient's symptoms, this may include skull and neck x-rays to look for broken bones and spinal issues or a computed tomography (CT) scan, which may be able to detect more serious brain damage. Depending on the severity of the injury, patients can experience a variety of traumatic brain injury symptoms. The chart below shows the symptoms of mild, moderate and severe traumatic brain injury, as identified by the National Institute of Neurological Disorders and Stroke (NINDS). Patients with moderate to severe TBI can have the same symptoms experienced by mild traumatic brain injury patients, but may also experience additional symptoms. Traumatic brain injury has become one of the most common injuries from the war in Iraq. Studies suggest that 10 to 20 percent of Iraq veterans (150,000 to 300,000 soldiers) have some level of TBI. At one point in the war, a staggering 83 percent of soldiers at one Washington medical center suffered from temporary or permanent brain damage. The reason may lie in the improvement in protective hardware. While advances in equipment and clothing have saved scores of American soldiers who likely would have died in past wars, they are sometimes left with serious injuries, namely traumatic brain injuries. People who sustain traumatic brain injuries are advised to seek immediate medical attention. While nothing can be done to reverse permanent brain damage, steps can be taken to ensure that additional damage does not occur. By monitoring a patient closely, doctors can attempt to control his or her blood pressure, ensure sufficient blood flow and make sure that the brain and body receive an adequate supply of oxygen. These traumatic brain injury treatment measures minimize the risk of brain swelling and further brain damage. Unfortunately, rehabilitation can be extremely expensive, and insurance rarely covers the entire bill. This is one reason the families of those who have sustained traumatic brain injuries seek legal help. A traumatic brain injury lawyer can help you gain compensation for rehabilitation as well as medical expenses, lost wages, pain and suffering and other expenses. The long-term prognosis of traumatic brain injury patients depends on the severity of the injury. A patient's level of disability also depends on age, health and location of the injury. Half of all patients with severe TBI need surgery to remove or repair ruptured blood vessels (hematomas) or bruised brain tissue (contusions). The following chart shows some of long-term problems associated with mild, moderate and severe traumatic brain injury. Plenty of injuries are the result of accidents that no one could have predicted; however, some people suffer traumatic brain injuries in auto accidents and other incidents where another person's negligence or wrongful actions are to blame. If you believe this may apply to a traumatic brain injury sustained by someone you know, you should contact a personal injury attorney to determine your legal rights. A traumatic brain injury lawyer will research the latest developments in this area of law; advise you as to your options and help guide you through the complicated legal process associated with your traumatic brain injury lawsuit. 1 The Brain Trauma Foundation. 2 National Institute on Deafness and Other Communication Disorders (NIDCD). 3 The Brain Trauma Foundation. 4 Brain Injury Resource Foundation. Males are twice as likely as females to suffer a traumatic brain injury.